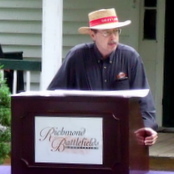 Two Core Battlefield Sites Saved: Over the last nine years, in seven separate transactions, the Richmond Battlefields Association has preserved large portions of the Second Deep Bottom Battlefield. The targeted properties contain the millpond, mill site, earthworks, the dry ravine, a road trace, and a wartime house. RBA's 35-acre Fussell's Mill site was key in the initial Union assault against the thinly-manned Baileys' Creek line on August 14, 1864. Our 25-acre Darbytown Road site saw vicious combat on August 16th as the Union army renewed the attack in an attempt to open the door to Richmond. Second Deep Bottom is one of the lesser known Civil War battles in the Richmond area, despite the 4,600 casualties incurred over several days fighting. The battlefield lies outside the purview of the National Park Service and so, it falls to private groups like RBA to protect this hallowed ground or lose it forever. 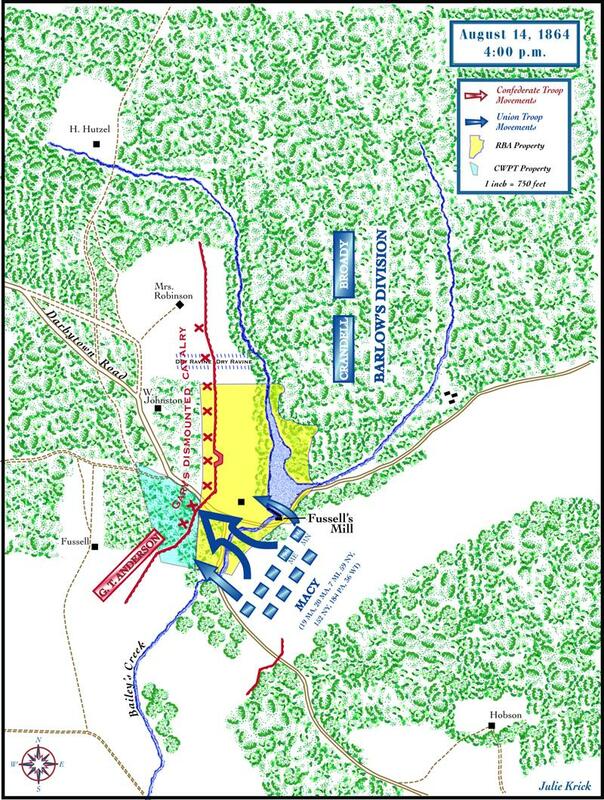 Throughout the summer of 1864, Union Gen. Ulysses S. Grant employed a strategy of simultaneous operations on both sides of the James River in an attempt to break the stalemate around Petersburg. By forcing the Confederates to deploy troops on two-fronts, Grant hoped to stretch their lines to the breaking point. 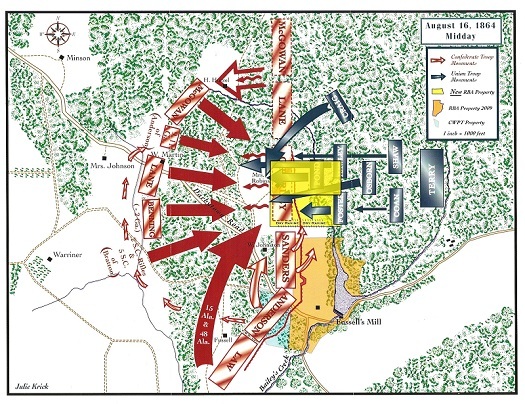 In mid-August, Maj. Gen. Winfield Scott Hancock was tasked with threatening Richmond north of the James, while Maj. Gen. G.K. Warren's command operated against the Weldon Railroad south of Petersburg. On the night of August 13, the Union Second and Tenth Corps, along with Gregg's cavalry division, crossed James River at Deep Bottom. Army of the Potomac II Corps: Deadly heat slowed the advance of the II Corps, giving the Confederates time to reinforce the Fussell's Mill area with Brig. Gen. George T. Anderson's Georgia brigade. Hancock had intended for Barlow's two divisions to carry out his primary attack. But Barlow extended his 10,000 man force too far north in the thick woods and was left with only a single brigade attacking Fussell's Mill. The Federals drove away two Confederate cavalry regiments from Brig. Gen. Martin W. Gary's brigade at the mill, but Anderson's brigade repulsed them. 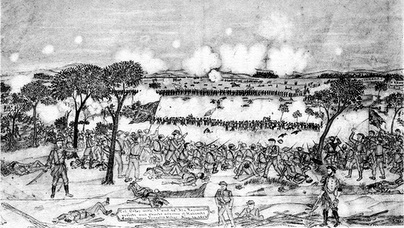 Army of the James X Corps: The heaviest fighting of the campaign occurred on the 16th. A bold frontal assault by Brig. Gen. Alfred H. Terry's division shattered the Southerners' line. Newly promoted general Victor J. B. Girardey, commanding a Georgia brigade, fell dead while attempting to rally his whipped troops. Parts of several Confederate brigades, buoyed by the presence of R.E. Lee, responded to the crisis. Confederate counterattacks surged to the lip of a Dry Ravine (below). Leading two Alabama regiments, Col. William C. Oates was severely wounded, losing an arm in the fight. In time, the Rebels fought their way into and across the ravine, driving the Federals out of a line of captured works. Heavy skirmishing continued throughout the remainder of the day. On August 20th, after four days of inactivity,the Federals returned to the southside of the James, maintaining their bridgehead at Deep Bottom. Confederate losses approached 1,500. The failed operation north of the river had cost the Union 2,900 casualties. The action had, however, drawn a substantial number of Confederates away from Petersburg. 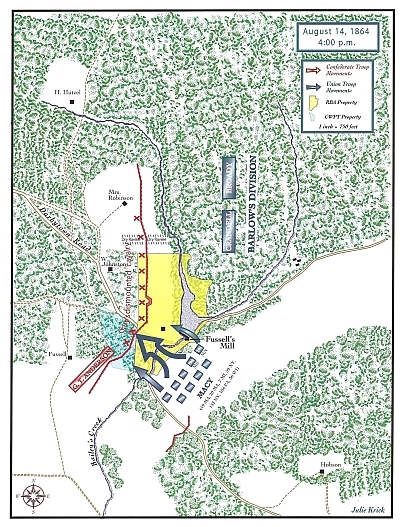 Grant seized the opportunity and in the Battle of Globe Tavern (Aug 18-21), captured the Weldon Railroad below Petersburg, depriving Lee of a yet another vital supply line. Above: Led by historian Mike Andrus, RBA members skirt the millpond at Fussell's Mill while touring the battlefield they helped preserve (June 2009). 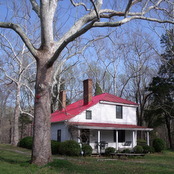 The miller's house at Fussell's Mill. 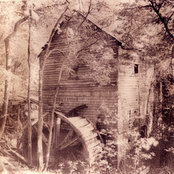 War time Fussell's Mill gave the battle its name. Historian Robert K. Krick delivers a talk on the role of the Alabama troops engaged at Fussell's Mill. At RBA's annual meeting, board member Sam Craghead displays artifacts from the Museum of the Confederacy's collection (June 2009). The 48th Alabama Regiment monument at the "dry ravine" site preserved by RBA. Here Col. William C. Oates lost an arm while leading a desperate counterattack. Board member Mike Andrus guides RBA tour of our Darbytown Road site on the Fussell's Mill Battlefield. Historian Jimmy Price relates the role of USCT troops at Second Deep Bottom (October 2015).